During the month of April, the new issue of Zona - Zona Monstra - was released on a couple of events: on Monstra, the Lisbon Animation Festival, and on Anigamix, a con dedicated to anime, comics, video games, and a lot more. I was in both events, drawing and signing, so check out a few photos before I post some new artwork! Here's the Zona pannel during the Monstra presentation: Joana Afonso, Miguel Peres, André Oliveira and Fil. Here's my a page of my work, next to Pedro Carvalho's, on Anigamix. Zona won an award - Best Editorial Comics Projects. Here I am talking to someone, next to Manuel Alves and Filipe Andrade. Sometimes I look too serious, sometimes I look downright silly. 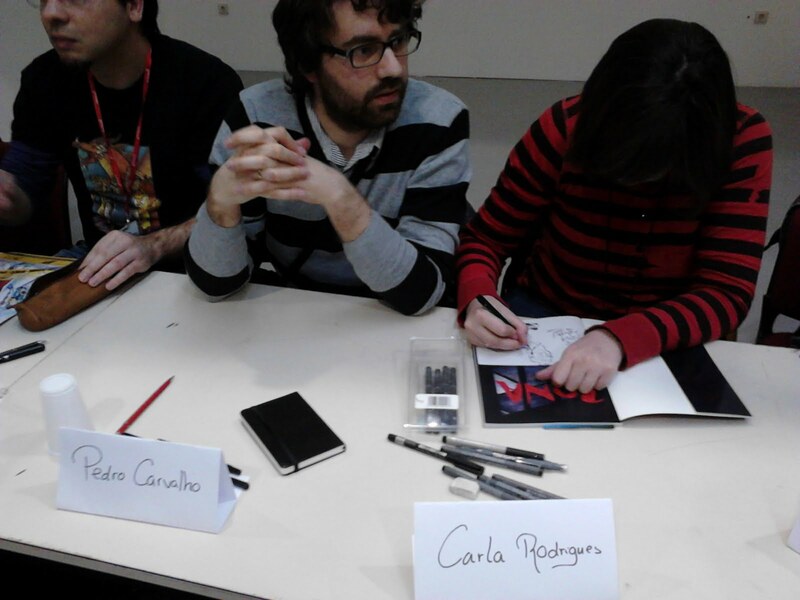 Here I am looking downright silly next to my friend Filipe Melo. I'll finish the post with me drawing on the collaborative mural at Anigamix. And that's it! I'm going to post some new drawings soon, I promise. I have new material ready to see the light. Stay tuned!